Ms. Young Ju Jeong joined the MCL in 2005 Fall firstly as a MS student and then a PhD student. Young Ju took a leave of absence, returned to Korea and worked as a research engineer in the Samsung Advanced Institute of Technology (SAIT) in 2007 August. She has resumed her PhD program remotely since two years ago by taking courses through DEN and communicating with Professor Kuo on her research progress. Congratulations to Young Ju for passing her Qual exam on January 13, 2015. Her proposal is “Autostereoscopic 3D Display Rendering from Conventional Stereo Sequences”. Her Qual exam committee includes: Jay Kuo (Chair), Sandy Sawchuk, Keith Jenkins, Panos Georgiou and Aichiro Nakano (Outside Member). Progress in the development of 3D displays has enabled human to reproduce a more realistic 3D world. However, it is difficult to generate 3D various display images from restrictive input contents. 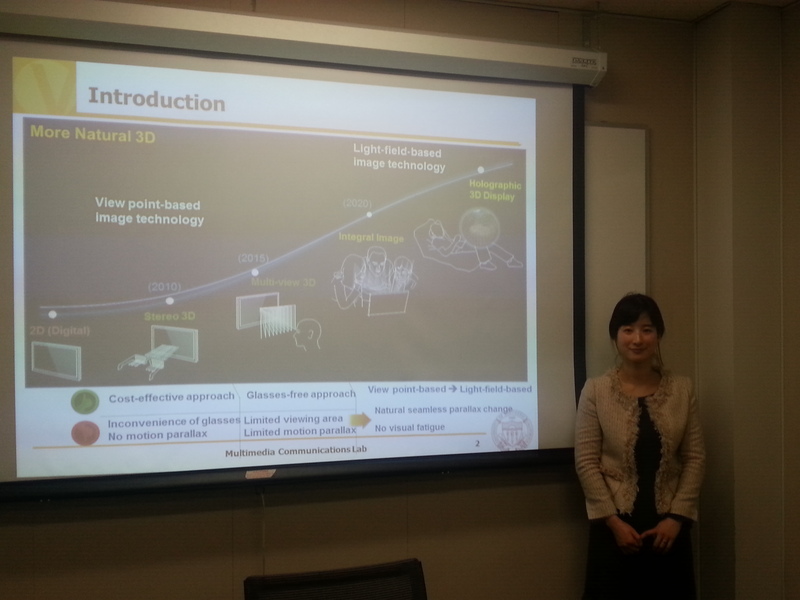 In her thesis proposal, Young Ju proposed a new framework for the 3D display representation. The first step for the creation of 3D display images is 3D reconstruction from the restrictive input contents. Under the estimated 3D structure, robust rendering with respect to uncalibrated artifacts is an important task. For the light field display, fast and efficient rendering for a huge number of pixels and memory usage is the main challenge. Young Ju introduced a new stereo matching algorithm that estimates disparities between high- and low-confidence regions separately. Then, she proposed an efficient multiview rendering algorithm for the autostereoscopic display that takes uncalibrated stereo as the input. Finally, she proposed an efficient light-field rendering algorithm that utilizes only a few input colors and depth images. Experimental results demonstrate that proposed stereo matching algorithm offers high quality results on real stereo contents captured by a stereo camera or synthetic stereo contents created via computer animation, and that multiview synthesis algorithm can provide well calibrated results without warping distortion and temporal consistent results.